ROME (AP) — Cristiano Ronaldo is still scoreless after three matches with Juventus. Juventus, however, is doing just fine. Mario Mandzukic scored one and set up another with a backheel pass as the Bianconeri won at promoted Parma 2-1 on Saturday to remain perfect. 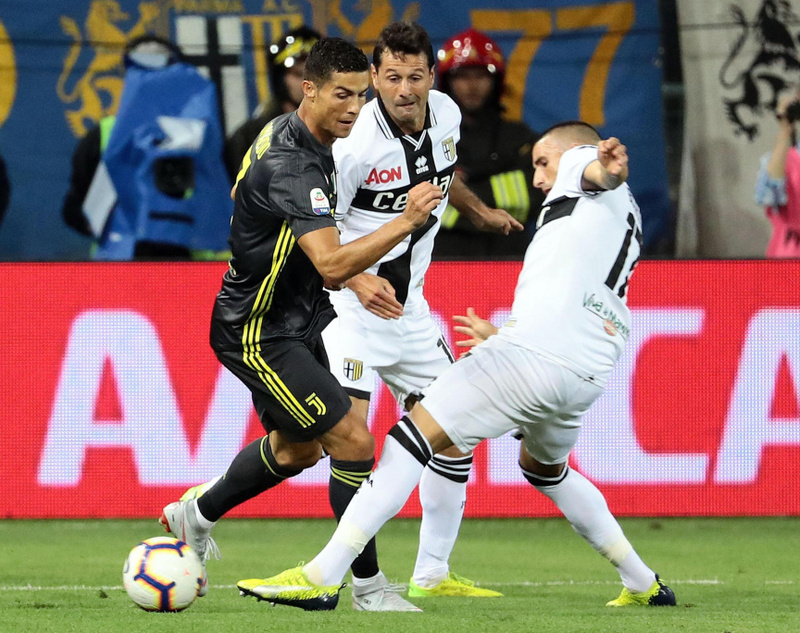 With Portugal Prime Minister Antonio Costa in attendance at Parma's Ennio Tardini Stadium, the closest Ronaldo came to scoring was with a header off a corner that went just wide midway through the first half. Ronaldo was also visibly upset when Mandzukic prevented the Portugal captain from connecting on a volley early on by getting there first — prompting an apology from Mandzukic. "I'm happy with what he's doing and the international break will help him get in better condition — because the league really starts after the break," Juventus coach Massimiliano Allegri said. Ronaldo left Real Madrid in the offseason in a Serie A-record 112 million euro (then $132 million) transfer, but he is still figuring out how to score in a league known for its defensive qualities. The five-time Ballon d'Or winner also didn't score in Real Madrid's opening three Spanish league matches last season — although he did score in other competitions for Madrid during that spell. Mandzukic put Juventus ahead two minutes in with an easy tap in following a failed clearance but it wasn't straightforward for the visitors as Parma began to threaten consistently. Parma's Leo Stulac struck a free kick off the crossbar and former Arsenal and Roma forward Gervinho equalized from close range after the half-hour mark. Blaise Matuidi restored Juve's lead in the 58th, taking a delightful backheel assist from Mandzukic inside the area before blasting in from a sharp angle. "I didn't expect (Mandzukic) in this form after the World Cup but he's in top condition," Allegri said of the Croatia international. Napoli and Spal, which are also perfect, each play on Sunday. Napoli visits Sampdoria and Spal visits Torino. Ronaldo's next chance to break his drought won't come until after the international break, when Juventus hosts Sassuolo on Sept. 16. When Radja Nainggolan signed with Inter Milan in June, coach Luciano Spalletti said he would give the underachieving squad the "boost" it needed. The Belgian midfielder, who is nicknamed "Ninja," fulfilled Spalletti's wishes in Inter's 3-0 win at Bologna, scoring the opener on debut to send the Nerazzurri on their way to their first Serie A victory of the season. After a draw and loss in its opening two matches, Inter was looking at another disappointing result until Nainggolan scored in the 66th minute. Using his left foot to control a pass from Matteo Politano, Nainggolan unleashed a powerful shot with his right foot into the far bottom corner from the center of the area. "He still needs to improve his condition. He didn't do all that much but the little he did was good," said Spalletti, who previously coached Nainggolan at Roma.